Russian test pilot cosmonaut, 1990-1996. Status: Inactive; Active 1990-1996. Born: 1952-08-10. Birth Place: Povalikha, Altay. 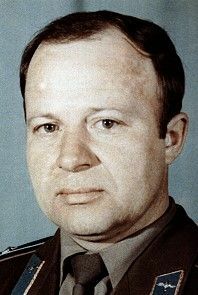 Graduated from Barnaul Higher Air Force School and from Akhtubinsk Test Pilot School 1974 and 1983 respectively Soviet Air Force Test Pilot School. Cosmonaut training March 1989 - April 1991. Chief of the flight test office of NPO Radon in Moscow. In 2000 he became a test pilot at the State Research Institute Sheremetevo. Later he worked at the Akhtubinsk flight test center of GKNII. 1952 August 10 - . Birth of Nikolay Alekseyevich Pushenko - . Nation: Russia. Related Persons: Pushenko. Russian test pilot cosmonaut, 1990-1996..